Who could resist this great sandwichboard advertising? I have a confession. 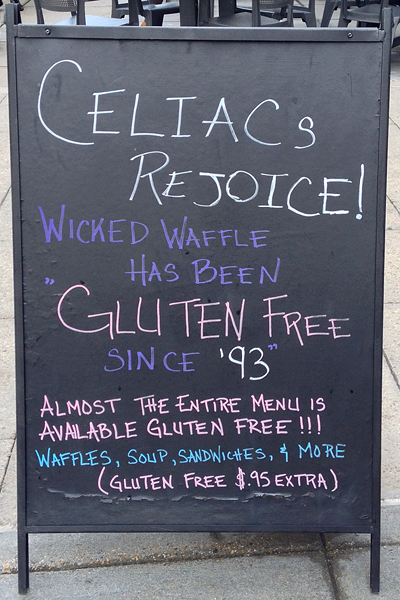 For over two years, I have worked within five blocks of Wicked Waffle, and I have been completely oblivious of their clear marketing to gluten-free eaters. Their sandwichboard sign, prominently displayed on the sidewalk out front, says it all. They are quite well-versed in gluten-free preparation, and almost the entire menu can be made gluten-free. The moment I stepped inside, I was certain that I was in good hands. I inquired about gluten-free waffles, and the sandwich makers immediately changed their gloves in order to prepare my sandwich without cross-contamination. The staff were also easily able to warn me against ordering the handful of sandwiches that could not be made gluten-free (the tuna melt was sadly on that list). 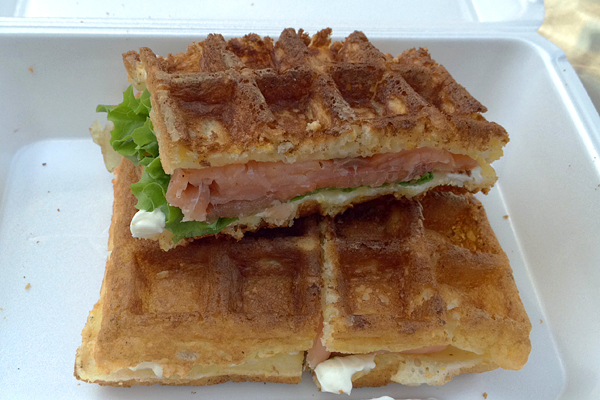 Ultimately, I couldn’t resist the Savory Nova, which is piled high with smoked salmon, cream cheese, capers, and lettuce and tomato. The waffle itself was just right: toasty, buttery, and just slightly sweet. It definitely ranks among the top gluten-free waffles I’ve had. With the gratuitous smoked salmon and capers, this was a really tasty and filling lunch. Lunch spots near Farragut Square tend to be mobbed at lunch time, but Wicked Waffle was pleasantly quiet. Though a little pricier than I usually like my lunches (sandwiches were $7-$9, plus the gluten-free option was an extra 95 cents), I will definitely be back. 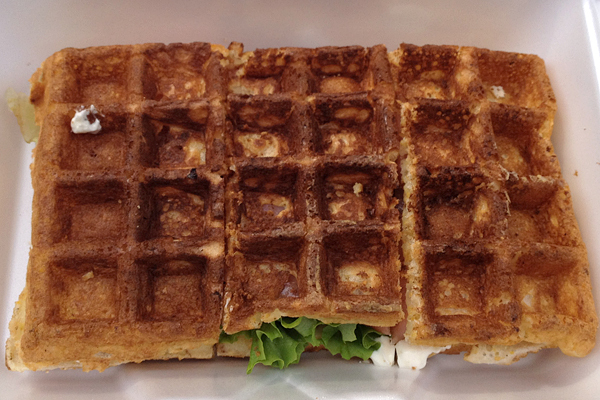 There are plenty more waffle sandwich combos to try! Have you tried Wicked Waffle yet? Where? Wicked Waffle is located near Farragut Square in Washington DC: 1712 Eye Street NW, Washington, DC (202-944-2700). Categories: Gluten-Free North America, Gluten-Free USA, Gluten-Free Washington DC • Tags: fast food • 2 Comments on Wicked Waffle: Washington, D.C.